Nokia 8 was launched in August 2017. Nokia 8 features a 5.3-inch IPS Quad HD display with a resolution of 2560 x 1440 pixels. Nokia is using the LCD 2.5D display with Corning Gorilla Glass 5 on top. The highlight of Nokia 8 is its dual-sight video feature, which supports live streaming for social media. Nokia 8 comes in 4GB RAM + 64GB storage option. The storage is expandable up to 256 GB via a microSD card. Nokia 8 comes in dual-SIM and single-SIM variants. Nokia 8 is powered by 64 bit Octa-Core Qualcomm Snapdragon 835 processor with up to 2.45 Ghz clock speed. Nokia 8 runs Android 7.1.1 Nougat. The smartphone has a metal uni-body design. 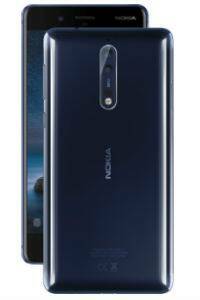 Nokia 8 sports Carl Zeiss’s 13 MP monochrome + 13 MP RGB lens at the back with 1.12um, f/2.0, PDAF, IR range finder, and dual tone flash. The front camera is 13 MP PDAF, 1.12um, f/2.0, and display flash. Nokia 8 is a 4G-VoLTE enabled smartphone, and it is splashproof with an IP54 rating. Nokia 8 has a 3090 mAh battery. Sensors on the Nokia 8 include: Ambient light sensor, Proximity sensor, Accelerometer, E-compass, Gyroscope, Fingerprint Sensor, Hall sensor, Barometer. Nokia 8 will be available in four colour variants – Polished Blue, Tempered Blue, Steel, Polished Copper.